Change the look of old cabinetry without sacrificing old wood charm. Preserve the character of the original finish while adding a modern twist to your original kitchen cabinetry. Revitalizing your cupboards is an integral part of any kitchen makeover. A new coat of paint that is professionally applied can make worn, tired cabinets look and feel new again. You can update the look and feel of your kitchen space with a splash of colour. Simply hire a professional at Affinity Renovations. In the marketplace, the average cost to replace kitchen cabinets can run between 8 and 15 thousand dollars or more. Do you have that in your budget? A unique makeover doesn’t necessarily mean that you have to replace those gloomy looking boxes with brand new cabinetry. Kitchen cabinet painting is an inexpensive way to improve the look of your kitchen space. If the cabinet doors and boxes are in good condition, but are looking a little bit outdated. Hire Affinity Renovations to breathe new life into your kitchen without breaking the bank. Change your cabinets from gloomy and dreary to sunny with a new coat of paint. The transformation will cost the fraction of the price than having to replace. So save your hard earned money but you can still get a new desired look. What is the best paint to apply to your kitchen cabinets? There are many to choose from; oil based paints are hard to clean. Oil paints dry harder than latex. The most recommended is a water based alkyd. Why worry about things like that? Let a skilled professional at Affinity Renovations worry about those decisions and execute a perfect transformation without losing that character of your kitchen space. Kitchen cabinets take a lot of abuse from stains, grease, moisture, constant door slamming and the obvious nicks and scratches that are forever present. How the kitchen cabinets stand up to the daily abuse depends in part how they’re finished and how durable they are. If maintained properly they can be salvageable and renewable. The kitchen cabinets are considered a focal point in your kitchen they take up a lot of space and demand that you look at them on a daily basis. If they’re painted in a colour you don’t particularly love, chances are you are going to get tired of them in no time. What Are Some Colour Options? Before you settle on any particular colour, take into account other items in the room and existing colours. Take into consideration walls, countertops, backsplash, floor and appliances. If there is a lot of colour already present, you may choose to go with classic whites or neutral coloured cabinets. There are so many colour possibilities at your disposal. Make an impact with antique white to have a contemporary, timeless classic feel. Other natural neutral colours may include; dark grey, light grey or maybe a combination of both. You have the power to incorporate colours that will suit your character and personality and add fresh new elements to your kitchen space. Think out of the box, there is no wrong colour selection. Possibly a yellow can represent warmth. You may choose to go with sky blue as it conveys an airy feel and it goes beautifully with the other kitchen accessories. The sky is the limit when choosing colours that best suits your kitchen space. 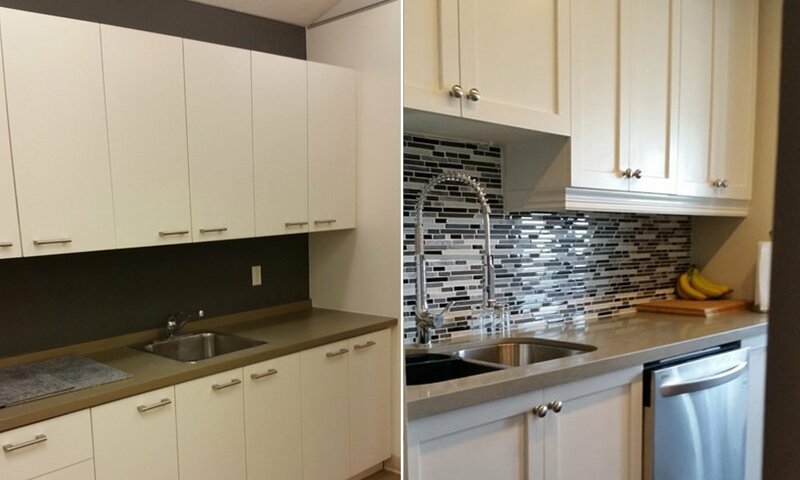 When you have a professional renovation company like Affinity Renovations to complete your kitchen cabinet painting, you can rest assured that the final product will meet your requirements. Change the design dynamic in your kitchen space by simply applying a professional application of fresh paint. What’s old is new again! Is it time for a Kitchen Face Lift! Here are the options that exist today. Roll on application less costly than Spray Option. Some work completed on site and some on site. Special Offer(Value $1,000.00) with Purchase of Kitchen if $20,000.00 or More. Please call to book your appointment today or consultation today!!! Friendly staff from start to finish. Salesman knowledgeable and helpful about product and impending project. Painter AWESOME! Did a great job, very thorough, clean, friendly and prompt. The painter also worked quickly and efficiently to complete the job on time.